Hydrophilic coatings refer to low friction and wettable coatings majorly applied to various medical devices including cannulas, catheters, and guide wires. Hydrophilic coatings on medical devices produce a lubricious surface reducing irritation and trauma caused by the insertion of a medical device in the body. In addition to this, hydrophilic coatings help to prevent the medical devices from bacterial colonization, thereby reducing the possibility of infections. The major factors propelling the growth of this market include the increasing adoption of hydrophilic coatings from end-use industries, such as healthcare, automotive, aerospace, and marine. Hydrophilic coatings exhibit water attracting properties and produces a hydrogen bond, which creates a lubricious and wettable coating that can be applied to a variety of surfaces and materials. Furthermore, the growing demand for lightweight materials in the automotive industry is expected to boost the growth of this market in near future. However, the high production cost of the hydrophilic coatings coupled with the lower shelf life of these products are the major factors hindering the growth of the market. In terms of revenue, North America dominated the hydrophilic coatings market in 2016 and accounted for a share of more than around 35%. This dominance is due to increasing awareness regarding the benefits associated with non-invasive surgery procedures including laparoscopic surgery, endoscopic surgery, and thoracoscopic surgery. 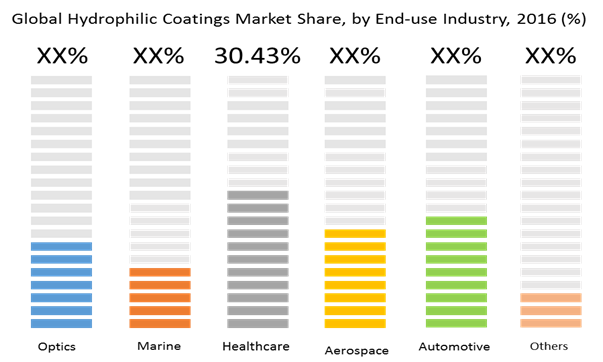 Furthermore, the rising penetration of hydrophilic coatings in the optics, aerospace, and automotive industries is largely contributing to the growth of hydrophilic coatings market in the region. The application of hydrophilic coatings on optical surface enhances transparency and provides clear vision, thus increasing the penetration level of hydrophilic coatings in various optical devices including outdoor surveillance, camera windows, and outdoor displays. According to the International Organization of Motor Vehicle Manufacturers (OICA), the U.S had manufactured around 3,934,357 cars and around 8,263,780 commercial vehicles in 2016. Hydrophilic coatings are extensively used in car windshields and rear-view mirrors in order to ensure clarity while driving during rains. This factor is highly responsible for the growth of this market in the U.S, which in turn is complementing the growth of the hydrophilic coatings market in North America. Asia Pacific is anticipated to be the fastest growing market for hydrophilic coatings, witnessing the highest CAGR of 8.83% during the forecast period (2017 - 2025). Major factors propelling the growth of this market include substantial growth in the income of middle-class population and the steadily growing geriatric population in the region, which is supporting the growth of medical sector, in turn increasing the demand for hydrophilic coatings in the medical devices. According to the United Nations Population Fund (UNFPA), the region is aging faster at an unprecedented rate and by 2050, one out of four people in the Asia Pacific is expected to be over 60 years. Furthermore, UNFPA anticipated that the geriatric population in the region is expected to triple between 2010 and 2050, amounting to around 1.3 billion people. The steadily growing healthcare sector in China is also propelling the growth of hydrophilic coatings market. According to Coherent Market Insights, the health care expenditure in China is expected to grow from US$ 355 billion in 2011 to approximately US$ 1 trillion by 2020. Based on end-use industry, healthcare segment emerged as the leading market in 2016 and is expected to retain market dominance throughout the forecast period. This is due to its lubricious coatings on the disposable medical devices including guide wires and catheters. These coatings lower down the insertion force, which reduces the possibilities of severe abrasion between the vessel walls and the surface of the device. Moreover, the qualities including biocompatibility, durability, sterility, and flexibility are some of the major factors propelling the growth of hydrophilic coatings market in the healthcare sector. Based on substrates, the hydrophilic coatings market is segmented into polymers, glass, metal, nanoparticles, and others. The polymer segment is expected to record a rapid growth in near future witnessing highest CAGR during the forecast period. Major players operating in the global hydrophilic coatings market include SurModics Inc., Aculon Inc., Surface Solutions Group LLC, Hydromer Inc., Teleflex Incorporated, AdvanSource Biomaterials Corp., Koninklijke DSM N.V., Covalon Technologies Ltd., and Harland Medical Devices. Hydrophilic coatings exhibit water attracting properties by forming hydrogen bond with water and is extensively applied to a variety of surfaces and materials, which are used in medical devices, optics, and automotive industries. These coatings are ionic in nature and have negative charge, which supports the hydrogen bonding with water. Furthermore, hydrophilic coatings on the surfaces of medical devices, produces hydrogel material having wettable and lubricious texture, which reduces the irritation caused by the insertion of a medical device into the patient body. The wide penetration of hydrophilic coatings in the various end-use industries including healthcare, optics, aerospace, marine, and automotive is fuelling the growth of global hydrophilic market. The rising demand for hydrophilic coatings, as an anti-fog agent from the automotive industry, is driving the growth of hydrophilic coatings market, due to the extensive use of these coatings in the automotive parts, such as body for glazing and rear-view mirrors, owing to its anti-fogging property. North America dominated the hydrophilic coatings market in 2016. This is majorly due to the increasing application of these coatings in the automobile parts. In addition to this, the steadily rising automotive industry in the region and technologically advanced medical facilities are propelling the growth of hydrophilic coatings market in North America. Asia Pacific is expected to project the fastest growth in the global hydrophilic coatings market during the forecast period. The rapidly growing geriatric population in the region is considered as the major factor, supporting the growth of these coatings in the medical devices. Furthermore, the substantial rise in the income of middle-class population is considered as another factor contributing to the growth of this market. This report provides in-depth analysis of the hydrophilic coatings market, market size (US$ Bn), and Cumulative Annual Growth Rate (CAGR %) for the forecast period (2017 – 2025). 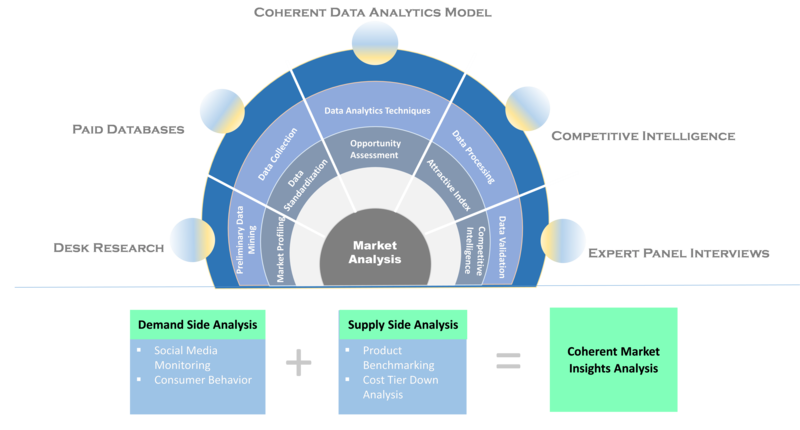 It elucidates potential revenue opportunity across different segments and explains attractive investment proposition matrix for this market. 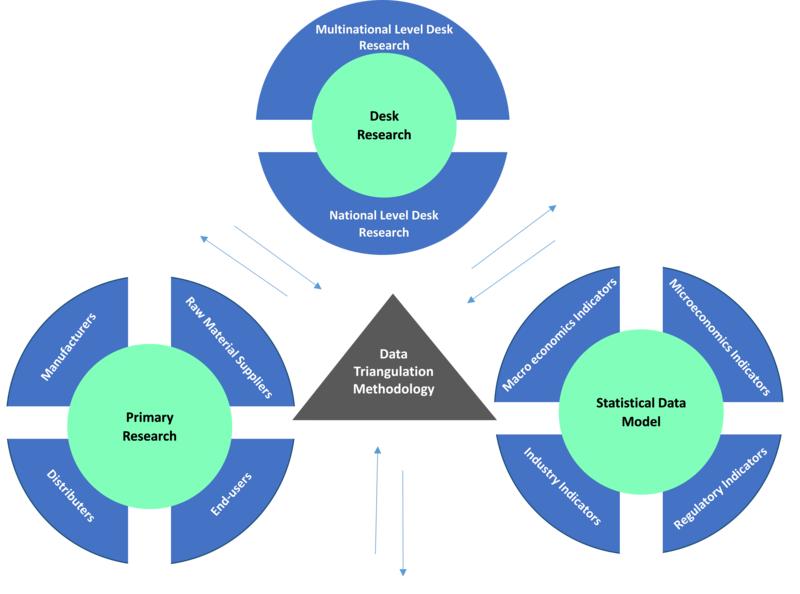 It provides valuable insights about market drivers, restraints, opportunities, new product launches or approval, pipeline products, regional outlook, and competitive strategy adopted by the leading players. It profiles leading players in the global hydrophilic coatings market based on the following parameters – company overview, financial performance, product portfolio, geographical presence, key developments, and future plans. The global hydrophilic coatings market report caters to various stakeholders in this industry, including investors, product developers, distributors, healthcare companies, research institutes, medical devices companies, new entrants, and financial analysts. Stakeholders would greatly benefit in decision-making through the various strategy matrices used in analyzing the hydrophilic coatings market. * Browse 100 market data tables* and 60 figures* on "Hydrophilic Coatings Market” - Global forecast to 2025.